Fake Stem Cells Making it to Prime Time? Stem cell therapy is proving to be an effective and safe way to treat musculoskeletal disorders while avoiding unnecessary surgeries. We know. We have been performing stem cell therapies for almost a decade now. There has been a tremendous increase in public awareness and interest on stem cell therapies over the last few years. Unfortunately, this has also led to a fair amount of misinformation and flat out scams regarding stem cell therapies. Most of these misinformation campaigns involve the use of off-the shelf products derived from amniotic membrane and/or umbilical cord blood, aka Fake Stem Cells. I have written previously (see HERE, and also HERE) about these ongoing scams: clinics using deceptive marketing techniques, calling their treatments “stem cell therapy”, when in fact what they use is dead tissue with ZERO live cells. Let’s be absolutely clear about this: an amniotic membrane product is NOT stem cell therapy. These products contain NO live stem cells, ZERO, NADA. Unfortunately, many clinics, trying to capitalize on the increasing popularity of stem cells in the treatment of musculoskeletal conditions, are deceiving their patients. They are marketing and selling these amniotic derived products as “stem cell therapy”. This used to be done mostly by the sales reps selling these products and by orthopedic surgeons using them. But now, organizers of “stem cells “ seminars, have created an entire new industry. These seminars are high pressure sale events done mostly by chiropractic clinics. Clinics that hire either nurse practitioners or physician assistants to perform injections using amniotic membrane/umbilical cord derived products. As I have explained in my previous blogs, these products are regulated by the FDA (they have to be, as they are products packaged and sold in the open market), and are approved specifically as an“acellular tissue matrix”. This means that they can be sold in the USA only because they have NO live cells. That is how they have been described to the FDA, and how they have obtained their FDA approval. So, if they have no live cells, how can these products be “stem cell therapy”? They are not. These seminars and these clinics are in the business of deceiving their patients. This weekend I was watching TV when I saw a stem cell program in my channel listing. I was excited to see if this was a reputable documentary about the tremendous healing power of stem cells. Sadly, I quickly found out that it was just an infomercial, put together by a company organizing seminars all over the country. Seminars that are mostly done by chiropractic clinics who hire them, with the purpose of trying to sell treatments using amniotic membrane products as “stem cell therapy”. Again, a scam. So, Fake Stem Cell Therapies making it to primetime. This is not the only company doing this, but maybe the most brazen I have seen so far. Why are all these clinics using products with no viable cells and marketing them as “Stem Cell Therapy”? Basically, because they want a shortcut into the biologics revolution currently taking place in orthopedic medicine. They want to attract patients looking to avoid unnecessary surgeries without spending the time, effort, and money required to get training and experience in regenerative medicine. And, most of these clinic they have little or no experience injecting joints and/or spine. They may not even have medical doctors performing these procedures. An experienced medical doctor to be performing the treatment using real stem cells? A nurse practitioner/physician assistant contracted by a chiropractor to perform injections with Fake Stem Cells (no live cells)? Are you going to place your trust in a clinic that lies to you about what they are injecting into your body? Be smart. If you are looking into stem cell therapies and come across any of these clinics using amniotic products (with their deceptive marketing techniques) keep looking. The only way you can get stem cell therapy, with real stem cells, in the USA, is if those cells have been harvested form your own body. And the only way those stem cells can repair the condition causing your symptoms is if they are precisely injected into the affected area. That takes knowledge, experience, and the proper equipment. If you are planning to attend a stem cell therapy seminar, do your homework first. Be aware of the ongoing scams and be prepared. In this blog I give a list of important questions to ask at any of these seminars. 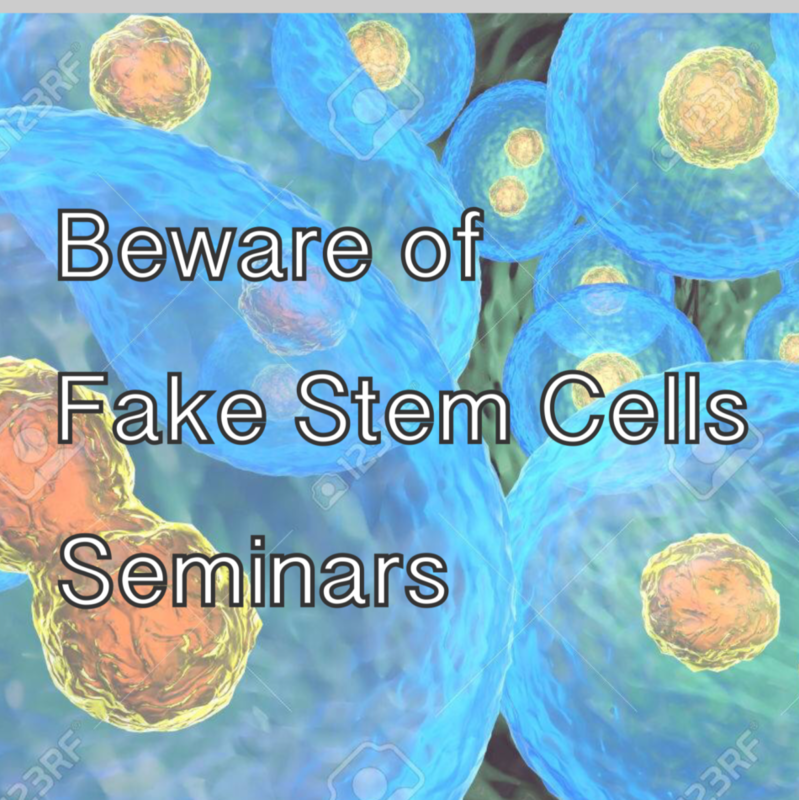 Don’t be duped by Fake Stem Cells seminars. To learn more about non-surgical alternatives to joint replacement or spine surgeries go to: www.dontoperate.com .